“Mrs.William is amazing. She is a people person, she was in here right away during the summer and is devoted. She is very easy to talk to, student orainanted and I am excited about her ability to communicate. She has been in my classroom twice already in the first two days of school and I think that is very important,” history teacher Christine Coyne-Logan said. Cory Williams sits in a floral dress with a cardigan and jewelry that compliments her already professional outfit. 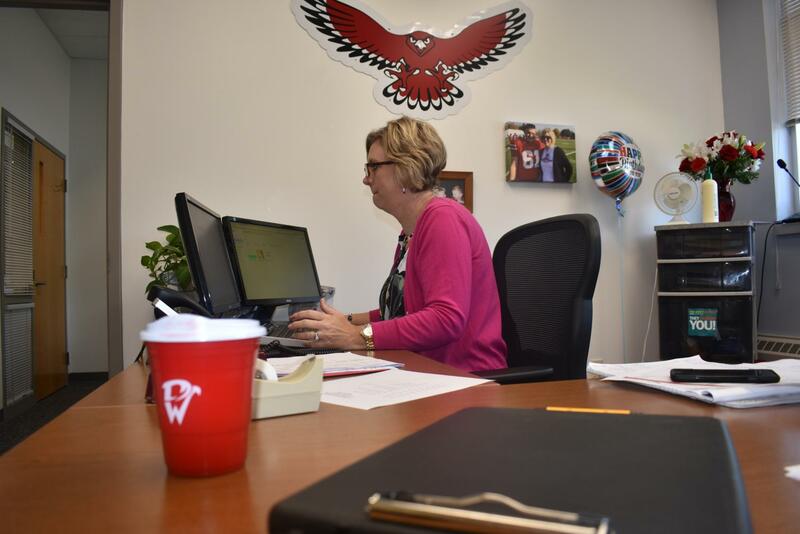 While walking past her office, one will find inspirational posters, notes from former students, pictures of her family and a soaring Falcon covering the crisp white paint. From that description I would be leading you to believe Williams is the classic adult here to make you throw your high priced coffee away and put your backpack in your locker. Her real goal is to improve the school and help make West a safe yet enjoyable experience for all students, while still preparing students for whatever their future holds. “Mrs. Williams is amazing. She is a people person. She was in here right away during the summer and is devoted. She is very easy to talk to, student orainanted, and I am excited about her ability to communicate. She has been in my classroom twice already in the first two days of school and I think that is very important,” history teacher Christine Coyne-Logan said. Originally from Texas, growing up Williams wanted to be a banker until her mom talked her into teaching. When Williams went to high school, she remembers, on an energy conservation day, students coming to school on their horses instead of driving. Her school also had a rodeo team that she sadly did not take part in, but instead found a love for volleyball and received a scholarship to Cameron University in Lawton, Oklahoma. It was there she met her husband and moved to Iowa. She started teaching at West when she was 22 years old as a physical education teacher. “It has been my goal and my dream to one day be the principal at West High so I have been working towards that,” Williams said. While working as a P.E. teacher, she became close with many of the staff that is still here. “I am glad Cory Williams is back here at West. She is off to a very good start. She is very positive and organized. I know she will do a good job here at West High,” English teacher Pat Sheehey said. After teaching for some time, Williams decided she wanted to go into administration. Her first job was at Rocky High school. As time went on, she was a principal at Williams Intermediate, Mid City, North and Truman Elementary. Williams has decided that her next goal to tackle would be to end her career at West. West has always felt like home to her, even after all the different schools she has been to. Williams still remembers the Falcon fight song. Of course with a new principal change is expected. One of Williams’ goals is to prepare students for the real world. Rules such as no drinks and no food or no backpacks are now allowed as long as students can be respectable with the new freedoms. “I want your generation to figure things out on your own, because there are times when you don’t have anyone to pick you up and you do have fall, and you fall hard. You just have to pick yourself up and go,” Williams said. To feed her fierce personality, Williams enjoys reading mysteries and watching “CSI” and “Blue Bloods”. And if being a principal, a mother, a wife, and a teacher isn’t enough prove that Williams is a “do it yourself person,” she also has an extensive knowledge on grading yard after 19 years of running her family construction business Williams Company. At the end of the day, Williams really hopes to help students have the same love for West that she does, and hopes it will become home away from home. “My goal is to make you guys feel once a Falcon always Falcon,” Williams said.